As I’ve mentioned before, my father was adopted as a child. While I’ve researched his adoptive family, only recently have I began to enter all the information I’ve found to my tree. Harvey and his family was easy to research. I have a copy of “The Harvey P. Fry Family” a compilation of facts written by Laura Lynn Greenaway, Harvey’s granddaughter. I found this picture in my grandfather’s possessions. 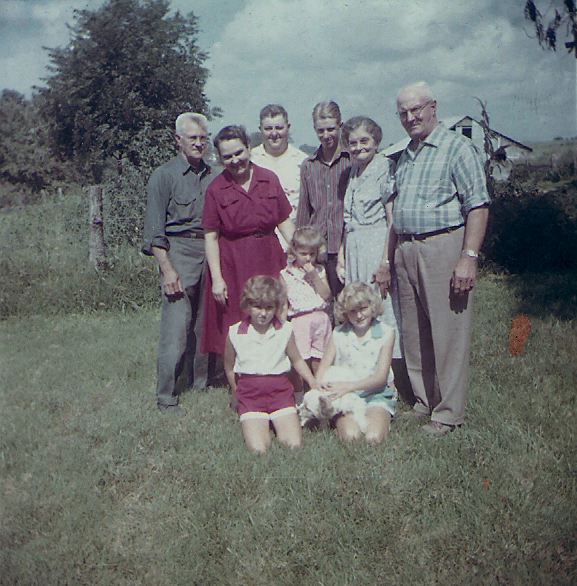 From left to right is Gordon A. Frye (my grandfather), Bebe Frye (my grandmother), Bill Gochnour (Harvey’s son-in-law), Randy Frye (my father), Lena Fry and Harvey Fry. In front are the daughters of Nelda (Lena & Harvey’s daughter) and Bill. I’m not sure which is which but their names are Lena Lucinda, Nelda Denece and Doris Alvaretta. This photo was taken August 5, 1959. I’m assuming it was taken in Berryville, Arkansas as my father never mentioned visiting family in Pennsylvania, where Harvey and Lena lived. 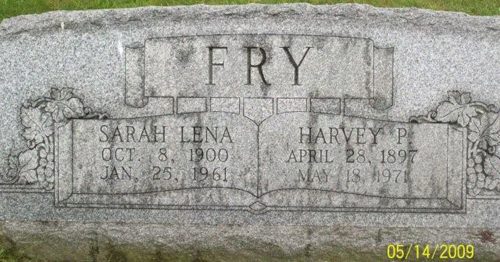 Lena and Harvey had eight children: Harvey Quentin, Lena Janice, Regis Carlyle, Nelda Glenorh, Estyl Delwyn, Cherrell Leoner, Nettie Carolyn, and Una Karen. An interesting fact I learned about the youngest child is that she wasn’t named until a year after her birth. Harvey didn’t care for his middle name; he was named after the doctor who delivered him, Dr. Peterman. Family called him Harve or Harvey; friends and associates called him H.P. He didn’t like to share it with people, and who could blame him. How would you like to go through life with the name Peterman? It’s been fun learning about my adoptive grandfather’s brothers and sisters. My journey is nowhere near complete. I hope to share more interesting tidbits about my Fry roots in the near future. Until then, may all your genealogy research be fruitful. 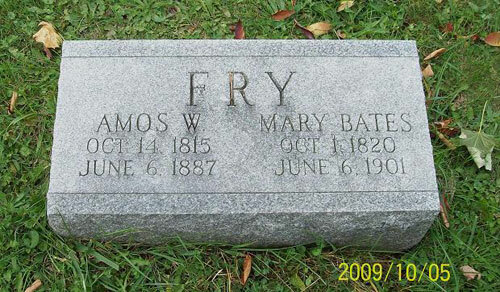 Tombstone Tuesday – To participate in Tombstone Tuesday simply create a post which includes an image of a gravestone of one or more ancestors and it may also include a brief description of the image or the ancestor. This is an ongoing series at GeneaBloggers. My 2x great-grandparents (on the adopted side). Harmony Cemetery, Harmony, Clearfield County, Pennsylvania, USA. 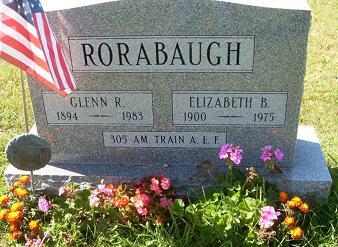 Special thanks to Sue at Find A Grave for taking this photo for me.